I like to give and receive gifts, but LOVE to wrap them even more. I like to come up with creative and clever ways to present the gift that are a little out of the ordinary. No store bought wrap for me, but I still love quick gift wrap. The tall triangular box this gift came in presented me with a bit of a challenge. If I sat it on its end it resembled a bottle of liquor. It’s for my daughter’s best friend, Julie, who is a college student and a bottle of spirits would probably be readily enjoyed, but I didn’t want to mislead her – so I laid the box on its side. 1. I first wrapped the box with white craft paper. 2. Next, I opened Microsoft Word on my computer. I set up the page for landscape orientation and used the font, Baskerville Old Face in a point size of 325. I changed the color for each letter and pressed the print button. 3. I glued the paper right onto the box. 4. Finally, I added the tulle ribbon bow for extra flair. Tada! Quick, simple, unique – that’s my style. 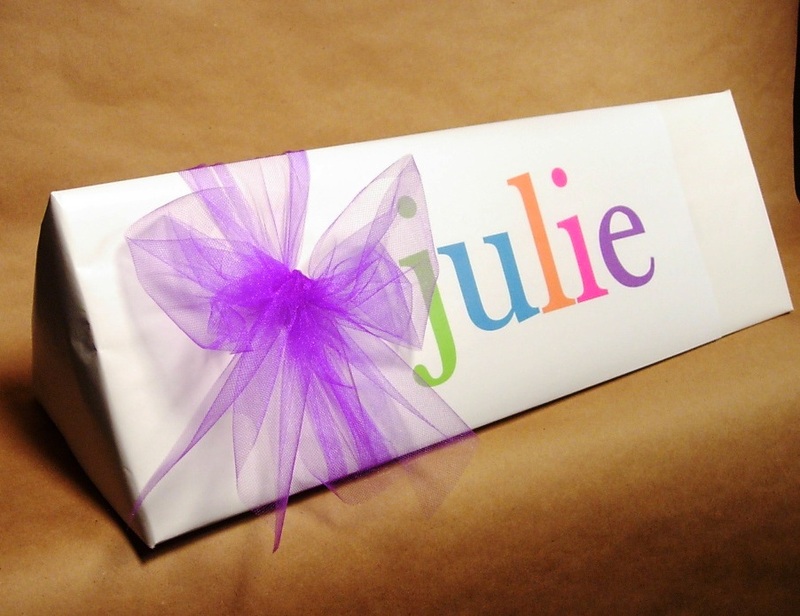 To see other ways I have wrapped and presented gifts over the years, check out my Gift Wrap Gallery. I simply “LOVE YOUR STYLE”!!! There are so many things that could be wrapped up in that container. Loving this. Happy and festive looking but oh so simple. You clever girl. I just love knowing there are others out here that love this quirky form of creativity as much as I do. That is awesome!!! When they work, aren’t computers the best!?!? Thanks so much for linking up to my party!!! Found this featured on Somewhat Simple, and I love it! I’m totally going to try it. Thanks for sharing!